Researchers have spotted the fastest-growing black hole ever found; it devours a mass equivalent to Earth's sun every two days. Researchers have spotted the fastest-growing black hole ever found — and have seen the (thankfully) distant devourer consume a mass equivalent to Earth's sun every two days. Researchers used newly released data from the European Space Agency's Gaia satellite to confirm that the brightly shining object is a black hole, which appears to have been the mass of about 20 billion suns when the light was released and was growing by 1 percent every million years, researchers said in a statement released today (May 15). "If we had this monster sitting at the center of our Milky Way galaxy, it would appear 10 times brighter than a full moon. 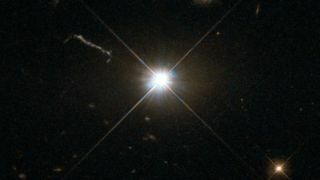 It would appear as an incredibly bright, pinpoint star that would almost wash out all of the stars in the sky," he added. Luckily, though, the black hole is far enough away that it likely released its light more than 12 billion years ago, the researchers said. The energy it emits is mostly ultraviolet light, but it also releases X-rays. "Again, if this monster was at the center of the Milky Way, it would likely make life on Earth impossible with the huge amounts of X-rays emanating from it," Wolf said. Because of its distance and the expansion of space, that light had shifted into the near-infrared during its billions-of-years journey. Wolf and his colleagues spotted the light with the SkyMapper telescope at the ANU Siding Spring Observatory. They then used the Gaia satellite to measure that the object was sitting still, thereby also confirming that it was incredibly distant and likely a supermassive black hole, the researchers said. Then, another ANU telescope measured the wavelengths released from the object to verify its composition. "We don't know how this one grew so large, so quickly in the early days of the universe," Wolf said. "The hunt is on to find even faster-growing black holes." With giant new ground-based telescopes currently under construction, scientists will also be able to use bright, distant objects like this voracious black hole to measure the universe's expansion, the researchers said.